Yesterday morning, for a brief 49 minutes, I wasn’t very thankful for Navy SEAL, Lt. Michael P. Murphy. But today I am. And I will continue to be, every day until the next time I subject myself again to the particular workout that bears his name, simply called “Murph.” It’s a CrossFit exercise explained in this New York Times article. He called it body armor, because it so effectively made you stronger and faster. And yesterday morning, when I was in the middle of it, I wanted to have a word with this guy and tell him what I thought of it, given the pain and strain I was under to complete it. But I couldn’t, because he was killed in Afghanistan, at the age of 29, in 2005 fighting for our country, for which he was awarded the Medal of Honor posthumously. In the United States, today is our holiday called Thanksgiving. As you read this, it might not be today anymore, but think back not too long ago, if you will. Many of my clients are not from the U.S., but this holiday is so easy to embrace that most seem pretty cheerful about going along. There’s nothing necessarily religious or geo-political about it. You get together with family and/or friends and eat. Humans like eating. But of course, Thanksgiving is also about being thankful. I’m not going to indulge in list-making today with all of things I’m thankful for, and it’s a long list. That’s not the point of this blog. But I will relate it to living sales excellence. Thankfulness is a close cousin of gratitude. Being thankful is about acknowledging what’s good in your life. Gratitude comes from the good feelings you have for the people in your life. When you meet someone new, try bringing both of those feelings to the surface. Find a reason to feel thankful for this new encounter. Find something about them to appreciate and feel grateful to them for sharing that part of themselves with you. Isn’t that a recipe for rapport? Now try it with a prospect? See how your tone changes, how relaxed you become, and how your good feeling helps make the dialog more natural and conversational. Your appreciation and understanding, born of a genuine sense of gratitude and thankfulness, moves the conversation in a positive direction, allows people to breathe, and opens them up to consider your offer of help where there might once have been resistance. Isn’t that the first step in the sales process? I’m sore today from the Murph yesterday morning, but I completed the exercise and made another incremental improvement. I’m one day stronger, one day healthier, and one day closer to a personal goal. I spared you my long list today, but it is worth remembering, on this day of Thanksgiving, that Lt. Murphy and so many others have died for the cause of our health and safety. 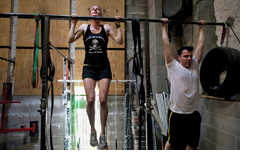 I learned about this man from Mike Collette, who owns the CrossFit gym where I work out. My gift to you on this day is to make you aware of a book entitled, Just Listen, by Mark Goulston. I’ve included it on my book list, but I call attention to it today because it holds the secrets of rapport – of understanding and appreciating the world of others. I hope you enjoy it. Thanksgiving is a day that generates feelings that are just like those that help us build the kind of rapport that is so helpful in the early stages of the sales process, unless of course, you’re in the middle of the Murph. But like any worthwhile effort, the pain of the exercise goes away, leaving you stronger and maybe a little better than when you started.